Can a reclining wheelchair assist with postural management? A reclining wheelchair is designed to meet the individual needs of the user, providing flexibility over sitting angle and positional change. It does this by increasing the angle between backrest and seat, often in conjunction with other features including adjusting foot rests and accessories to reduce sheer such as sliding backrest that moves with the user during recline. To support posture a seat or wheelchair must allow the user to maintain a safe and functional body position specific to their needs. This includes minimising strain on joints, musculature and ligaments whilst maintaining skin integrity by reducing friction, sheer and other causes of pressure. Reclining wheelchair systems have primarily been used to allow the user to stretch and change body position primarily to support pressure care and comfort in the same way that anyone else becomes uncomfortable sitting in the same position for long periods. 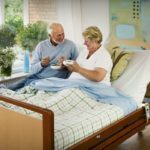 However, there is a longstanding and on-going debate about whether reclining wheelchairs or tilt-in-space provide the greatest amount of postural support as well as having other health and well-being benefits. Both reclining wheelchairs and tilt systems can provide pressure relief, increase circulation, improve head, neck and trunk control, improve functional posture and positioning, support safe transfers by various means and minimise variations/fluctuations in the user’s muscular control. As a reclining wheelchair increases the angle of backrest to seat it allows the body to move. This is a good thing as redistributing weight from under the person’s bottom to the back support helps to reduce pressure and increase comfort. However, if the user is unable to apply pressure through the footplates to support repositioning of the bottom as the back support reclines then repeated shear (when skin remains static but connective tissues move with the body) can cause significant skin damage over time. 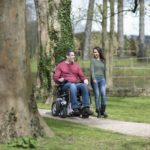 Without the ability to proactively adjust positioning it also means that the user can effectively slip down the wheelchair, having an impact on posture when the backrest angle is decreased. This also increases the risks of the wheelchair user slipping fully out of the seat or becoming trapped by the lap belt. A tilt system allows the wheelchair user to recline whilst maintaining all of the body’s angle as it changes the orientation in space, allowing posture to be maintained and pressure to be redistributed. Neither tilt nor recline systems are likely to be appropriate if the wheelchair user presents with abnormal movement or reflexes in a more supine position as this can be elicited regardless of pelvic position. However, if the user presents with extensor spasms for example (in Cerebral Palsy for example) then recline would not be appropriate but posture could be supported through tilt-in-space. As with all aids it is critical to consider what tasks the wheelchair user will be performing and how engagement is being supported. In the example of a client who is able to adjust their position or apply appropriate pressure through their lower limbs then a reclining wheelchair may better support workstation/desk activity for work. However, if needing to be reclined during that task it is unlikely to support posture for the remainder of the task therefore other modifications are likely required. In my experience the wheelchair user needing to consider a reclining wheelchair nearly always has alternative non-wheelchair solutions whereas the wheelchair user who is unable to use the alternatives will almost always have their posture better supported using tilt. In making recommendations consider the needs of the person (and their strengths), the environment in which they are engaging in activity and the nature/detail of the specific activity. No one product, tilt or recline, will be right for all. 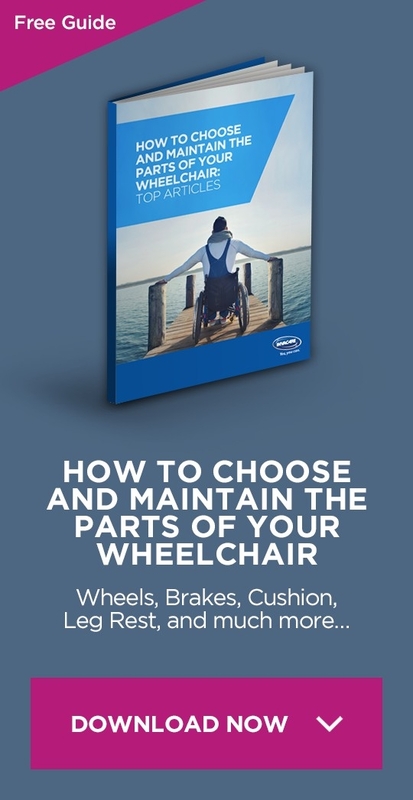 Wheelchair spare parts & accessories – what is available?